Ժան Պասսի16 դեմքի արտահայտությունները, որոնք արտահայտում են մարդկային կիրքը, հեղինակ Շառլ Լե Բռուն, 1821 թ. «Վիշտ», Վան Գոգ, 1882 թ.
Յուրաքանչյուր հույզ կամ հուզական վիճակ ունի երեք կողմ. Freitas-Magalhães, A. (Ed.). (2009). Emotional Expression: The Brain and The Face. Porto: University Fernando Pessoa Press. 978-989-643-034-4. ↑ Леонтьев Алексей Николаевич: Потребности, мотивы и эмоции. —Москва, 1971. ↑ Gaulin, Steven J. C. and Donald H. McBurney. Evolutionary Psychology. Prentice Hall. 2003. 978-0-13-111529-3, Chapter 6, p 121-142. ↑ Barrett, L.F. and Russell, J.A. The psychological construction of emotion. Guilford Press. 2015. 978-1462516971. ↑ Dixon, Thomas. 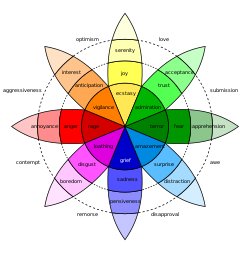 From passions to emotions: the creation of a secular psychological category. Cambridge University Press. 2003. 978-0521026697. link. ↑ 19,0 19,1 Hume, D. Emotions and Moods. Organizational Behavior, 258-297. ↑ Дарвин Ч О выражении эмоций у человека и животных. - СПб. : Питер, 2001. ↑ MacDougall W. An introduction to social psychology. - London: Methuen, 1923.